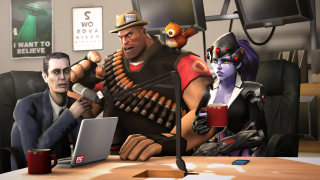 Every Tuesday at 1 PM Pacific we broadcast The PC Gamer Show live on Twitch. It's your chance to get your questions answered live on Twitch, and hear us talk about gaming news, hardware, and what we're playing. It's GDC this week, so we've got special guest Andy Schatz—Founder of Stopwatch Games, developer of Monaco—joining us on the show to give us an early look at Stopwatch's upcoming game, Tooth and Tail. We'll also be talking about the recent news that JJ Abrams is working on Half-Life and Portal movies, what we're excited to see at GDC, and lots more—including a Catfantastic quiz our usual Twitch chat Q&A. The awesome images we use for the show were made for us in Source Film Maker by Ness "Uberchain" Delacroix. You can find her DeviantArt page here and her Patreon page here.